Paro the furry seal cries softly while an elderly woman pets it. Pepper, a humanoid, waves while leading a group of senior citizens in exercises. The upright Tree guides a disabled man taking shaky steps, saying in a gentle feminine voice, “right, left, well done!”Robots have the run of Tokyo’s Shin-tomi nursing home, which uses 20 different models to care for its residents. 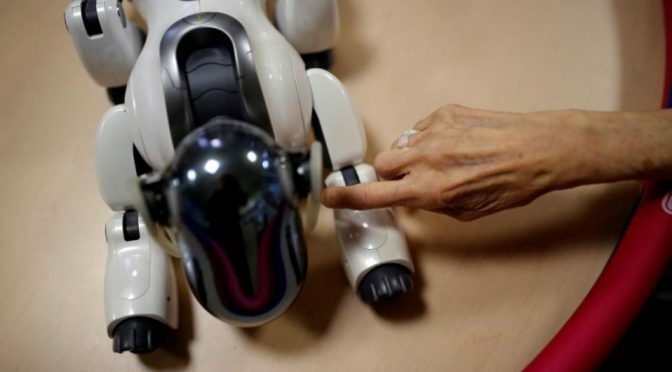 The Japanese government hopes it will be a model for harnessing the country’s robotics expertise to help cope with a swelling elderly population and dwindling workforce. Plenty of obstacles may hinder a rapid proliferation of elder care robots: high costs, safety issues and doubts about how useful – and user-friendly – they will be. The Japanese government has been funding development of elder care robots to help fill a projected shortfall of 380,000 specialized workers by 2025. Despite steps by Japan to allow foreign workers in for elder care, obstacles to employment in the sector, including exams in Japanese, remain. As of the end of 2017, only 18 foreigners held nursing care visas, a new category created in 2016. But authorities and companies here are also eyeing a larger prize: a potentially lucrative export industry supplying robots to places such as Germany, China and Italy, which face similar demographic challenges now or in the near future. More than 100 foreign groups have visited Shin-tomi the past year from countries including China, South Korea and the Netherlands. A few products are trickling out as exports: Panasonic Corp has started shipping its robotic bed, which transforms into a wheelchair, to Taiwan. Paro is used as a “therapy animal” in about 400 Danish senior homes. To nurture the industry, the government is using a two-pronged approach. METI is promoting development, providing 4.7 billion yen ($45 million) in subsidies since 2015. The labor ministry is spearheading the spread of robots, and spent 5.2 billion yen ($50 million) to introduce them into 5,000 facilities nationwide in the year that ended last March. There is no government data about how many care facilities use robots. Government officials stress that robots will not replace human caregivers. Most of the devices look nothing like the popular image of a robot. By the government’s definition, each has three components – sensors, a processor and a motor or apparatus. Panasonic used government aid to develop Resyone, a bed that splits in two, with one half transforming into a wheelchair. Cyberdyne Inc’s HAL – short for Hybrid Assistive Limb – lumbar type is a powered back support that helps caregivers lift people. Those needing walking rehabilitation can grab hold of Tree, made by unlisted Reif Co, which crawls along the ground, showing where to place the next step and offering balance support. SoftBank’s Pepper is used in about 500 Japanese elder care homes for games, exercise routines and rudimentary conversations. But some workers find Pepper difficult to set up, said Shohei Fujiwara, a manager at SoftBank Robotics, a unit of Internet conglomerate SoftBank Group Corp. They’d like Pepper to respond to voice commands and move around independently – functions that SoftBank hopes to introduce this year, he said. Cute, furry and responsive, Paro reacts to touch, speech and light by moving its head, blinking its eyes and playing recordings of Canadian harp seal cries. Paro took more than 10 years to develop and received about $20 million in government support, said its inventor, Takanori Shibata, chief research scientist at the National Institute of Advanced Industrial Science and Technology. About 5,000 are in use globally, including 3,000 in Japan. But Paro, like most robots, is expensive: 400,000 yen ($3,800) in Japan and about 5,000 euros in Europe. Panasonic’s Resyone bed costs 900,000 yen ($8,600) and Cyberdyne’s HAL lumbar exoskeleton costs 100,000 yen ($950) a month to rent. Most facilities using them, including Shin-tomi, have relied on local and central government subsidies to help cover the costs. Individuals can also use nursing care insurance to help cover approved products, but those numbers are tiny. And so far, the robots have not reduced Shin-tomi’s personnel costs or working hours. What they have done, he said, is boost the morale of both staff and residents.